In temperate areas of the country brown patch is mostly likely to become active during the late spring and summer. Infestation is swiftly triggered when nights are warm, winds are calm and the air is saturated with moisture closely mowed turf and particularly the bent grasses of golf courses are especially susceptible and easily damaged. Under ideal conditions many parts of tees, greens and fairways can be attacked simultaneously. All warm season grasses are affected in varying degrees, but it can become extremely destructive on St Augustinegrass (Buffalo turf) from autumn to early spring. Injury often covers large areas of turf and it is not unusual to see much of an entire lawn infected. During this same period, brown patch can be a particular problem on golf greens and other turf areas which have been over seeded to ryegrass. Moisture on the grass blade is essential to the spread of brown patch. If the air is saturated and atmospheric conditions favour moisture retention, an ideal situation is created. Guttated droplets clinging to the tips of blades not only contribute to the infectious environment, but also serve as a valuable nutrient source for the disease. The most vivid characteristic of brown patch is the “smoke ring” commonly associated with the disease. When disease activity is the greatest, this ring of dark grey fungus mycelium often surrounds the infected area, but disappears as the foliage dries. Even though this is considered as a key identifying feature, unfortunately it is not always present. Perfect conditions develop for the Rhizoctonia pathogen when temperatures remain consistently above 22°C and atmospheric moisture is correspondingly high. Initial infection starts in a circular pattern which may be no more than a few inches across. 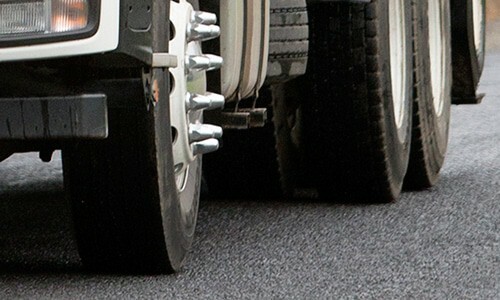 As the disease increases in intensity, the affected areas may grow up to one metre in diameter. Blades turn from a water soaked purplish green colour to dark brown and eventually wither and dry to a pale light brown. A ‘smoke ring’ of dark grey mycelium may surround the infection and on overcast, moist mornings it can persist well into the day. With the sun drying breezes, activity ceases and the smoke ring disappears. 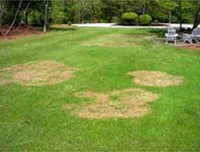 In many instances, brown patch can be active for some time without any impressive visible symptoms and light attacks often cause only wilting. If temperatures remain in the 25°C to 30°C range, with high humidity, damage can be severe. As temperatures rise above 32°C, activity ceases. Infestation on St Augustine grass (Buffalo turf) is roughly circular, lacks the smoke ring, and can cover large areas of turf. It is most destructive between 15°C and 25°C. Although crown and root rot are common severe brown patch attack on all grasses, St Augustine grass often shows the most destruction. Rhizoctonia solani, the brown patch pathogen, spends dormant periods as sclerotia. These small round bodies, about a sixteenth of an inch in diameter, are dark brown to black and compare very roughly to the seeds of a flowering plant. They are formed on the lower parts of infected plants or in soil debris. When temperatures reach the germinating period, mycelial threads spread outward from the sclerotia to start infection. Sclerotia of Rhizoctonia can survive for a number of years in the soil under many adverse conditions. Although grey leaf spot can infect a number of turf grasses, it is primarily a problem of St Augustinegrass (Buffalo turf). Grey Leaf spot is a summer disease that becomes particularly active during extended periods of hot, humid weather. Most turf diseases are especially injurious on tightly knit grasses, but grey leaf spot thrives on sparse, thin strands of St Augustine. For this reason, newly sprigged lawns are more susceptible to damage than established turf. Sprinkling, which is necessary to start new turf, is generally blamed for splashing spores from the soil to healthy plants. Grey leaf spot is not considered to be a highly destructive disease, and during the summer season, it is almost always present in varying degrees. When lesions become numerous, the turf often looks like it cannot survive. The elongated spots not only cover the leaves, but also sheaths, stems and seed stalks. But only in rare instances of prolonged neglect is the turf ever permanently damaged. When the atmosphere is saturated with moisture, and temperatures remain consistently in the 20°C to 25°C range, grey leaf spot becomes evident. Lesions first appear as tiny brown spots and rapidly enlarge to become oval. The oval spots eventually become elongated, with depressed greyish-tan centres. Lesions are bordered by a brown margin, and the brown margin is surrounded by a band of chlorotic yellow-green tissue. 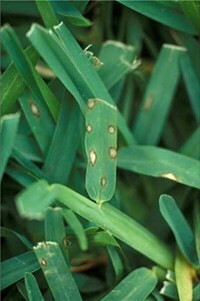 During peak disease activity, a grey mould-like growth often covers the blades. As the disease becomes more obvious, lesions can be found on sheaths, stems and seeding spikes. Lesions on leaves, sheaths, and spikes are very similar, while those on stems are dark brown, or almost black. During severe attacks, plants take on a withered, dried, or scorched appearance which is quite often mistaken for drought damage. Adult African black beetles, Heteronychus arator, invade turf environments during spring every year. They do some damage by feeding on stems and roots of the grass, but generally this damage is not severe enough to warrant a beetle spray to control them. The exception is where mound formation by their tunnelling is unacceptable, such as on putting greens and bowling greens. 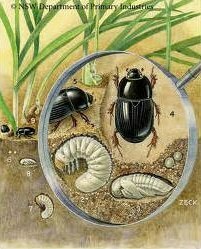 When the moisture in the soil is suitable, the beetles mate under the surface and the female lays up to 80 eggs, about 25-30mm below the surface. This usually occurs between the third week in October and the second week in December. The eggs swell to about twice their original size, to 2mm, and hatch in about two weeks. The larvae are tiny; about 5mm long and 1mm in diameter. They begin feeding on organic matter in the root zone, initially near the surface then move deeper as they grow. During the next 10 weeks they shed their skin twice, moulting to second and third instar stages. By late January they are about 25mm long and ready to dig down to about 120mm where they construct a pupil chamber for themselves. The new generation of adults emerges from these chambers during late summer and autumn. They tunnel to the surface and fly away to other turf areas or to grasslands where they spend the winter. Most significant damage is caused to turf during mid-summer by the second and third in stars. They damage roots, limiting the plants’ capacity to take up water and nutrients, and extensive areas may brown and die off, particularly if moisture is less than adequate. 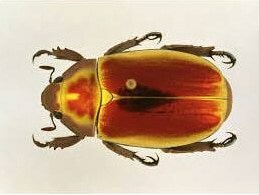 The Argentinian scarab beetle, Cyclocephala signaticollis, was first reported in Australia in the mid 1950’s, and has now spread up and down the NSW coast. In the past decade it has become a widespread and serious pest of recreational turf areas. The adult beetle is very similar in size and shape to the better known African black beetle, but is coloured a mid-tan, with subtle striping on the wing carapaces. Beginning during December, the larvae cause considerable damage to grasses, which can be accentuated by widespread bird-feeding with associated tearing of the turf and by the fact that larval numbers can be as high as 350 per square metre. 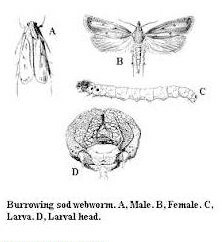 The Fall Armyworm, Spodoptera frugiperda, is the larval stage of dull grey-brown moths that hide during bright daylight and then become quite active during the evening. Moths have a wingspread of about 1 1/2 inches and dark forewings mottled with patterns of light and dark spots. They lay eggs in masses of a hundred or more on the leaves of grass or other foliage. Tiny larvae hatch in about a week and within three weeks become full grown Fall Armyworms. Colour varies from light green to brownish-black, with several stripes along the sides. They reach a length of approximately 1 1/2 inches and a light cream coloured inverted “Y” covers a shiny brown head. Sparse, long hairs arise from tubercles along the length of the body. Three pairs of legs are arranged near the head and four pairs of stump-like pro legs are found toward the rear of the body. There are several species of Armyworms. The True Armyworm Pseudaletia unipuncta looks very much like the Fall Armyworm, but lacks the inverted “Y”, which appears on the head. It is found less frequently in turf, but can be extremely destructive when present. If you see moths landing on your lawn around dusk, or there is increased bird activity on your lawn, you might experience grubs in the not too distant future. Insects that lay the larvae are most active in the spring months through to early autumn. Armyworms hide in the thatch during the day and feed at night, cutting off grass close to the crown. They can be detected by placing a wet hessian bag on the grass overnight and inspecting underneath in the morning. Chewing along the edges of grass blades, the Fall Armyworm skeletonizes the grass and gives it an overall ragged appearance. In severe infestations, the grass can almost be chewed to the bare ground. You may notice brown patches of lawn where the lawn appears to be dead, and you will be able to pull the lawn up easily because the roots have been eaten away by the grubs. Shortly after the larvae reach maturity, they tunnel several inches into the soil and start pupation which takes about ten days. The lawn may also feel spongy in the affected area. 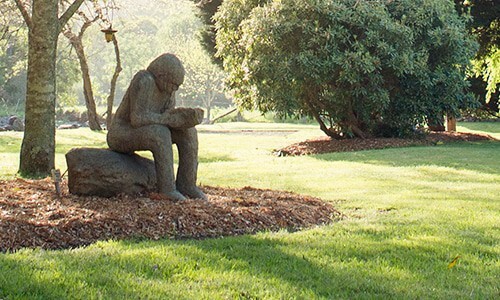 A Sir Walter Buffalo lawn should recover well from a grub attacks with treatment, however some other varieties may not recover as quickly or at all. Identification of grub activity and rapid treatment with Sir Walter Pest Control will limit the damage and aid in a quick recovery. The Sod Webworm, Family Pyralidae, is the larval state of the tan or buff-coloured lawn moth. Lawn moths are commonly seen in the early morning flitting above the turf in short zig zag patterns. 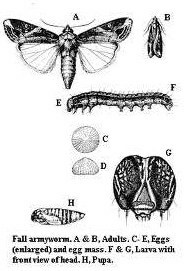 As the moths fly, they drop eggs which hatch into larvae in just 6 to 10 days. The tiny larvae start feeding on grass blades and building silk-lined tunnels in thatch and debris near the soil surface. Sod webworms are nocturnal insects so they chew and feed at night and remain hidden during the daylight hours. They feed on tender parts of the grass, and as they grow, their appetites increase. Soon entire plants can be destroyed and irregular patches of dead turf appear. When mature, the sod webworm reaches a length of about 3/4 inch. It is a dingy dull, tannish-brown, but occasionally some species take on a greenish cast. Long, stiff hairs protrude from the brownish-black circular spots that are spaced along the sides and the back. The head is dark, shiny brown. The sod webworm is elusive and often evades detection, but many birds on the turf are a good indicator. The birds probe the drying turf with their beaks and leave behind a pattern of holes about the diameter of a pencil. Another sure sign of sod webworms is the material called frass. These greenish, course sawdust-like particles are formed by the webworm as it chews and feeds on the grass. Sod Webworms eventually evolve into a brown, shiny pupal stage, which is spent in crevices or cells in the soil. They emerge as adult moths only during warm summer weather. Winter months are spent in the larval stage, burrowed and hidden in silk lined tunnels. In tropical areas, sod webworms can produce several generations per year. Identification of Sod Webworm activity and quick treatment with Sir Walter Pest Control will limit the damage done to your lawn and help it to bounce back quickly. It is vital to use pesticides and other garden chemicals only as directed by the manufacturer. Keep pesticides and herbicides well labelled and out of reach of children at all times. It is most important wear the appropriate protective clothing and eyewear when using pesticides to ensure skin does not come into contact with the substance. For more information about correct storage and use of household chemicals visit the Poisons Information Centre website. In the case of immediate danger and emergency assistance call Emergency 000. For non-life threatening cases call the Poisons Information Hotline 13 11 26 for more information.